The new game from the makers of Heavy Rain promises a chance to see what lies beyond the the veil. 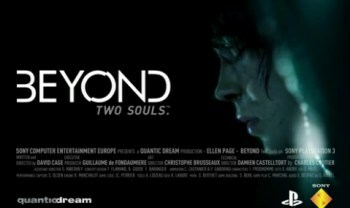 The first big news to come out of Sony's E3 press conference was announced by none other than David Cage, the founder and CEO of Heavy Rain developer Quantic Dream, which is working on a new game called Beyond. Beyond will follow the life of Jodie Holmes, a woman who's always felt the link between our world and "the other side," as she grows and evolves over 15 years - and discovers more about what's beyond. "For the first time ever, we will lead the life of a character," Cage said. Details are sketchy, as you'd expect, but the big news is that the role of Jodie is being played by Academy Award-nominated actress Ellen Page, the star of films like X-Men 3, The Stone Angel and Inception. She didn't have much to do in the short teaser that played at the press conference but the technology on display, particularly the facial rendering, is nothing short of stunning. Good or bad, this will be one amazing looking game. Beyond will be "mature and unique, but breathtaking and spectacular," Cage said. "If you make the right decisions, maybe you will discover what lies beyond." Alas, no release target was announced.